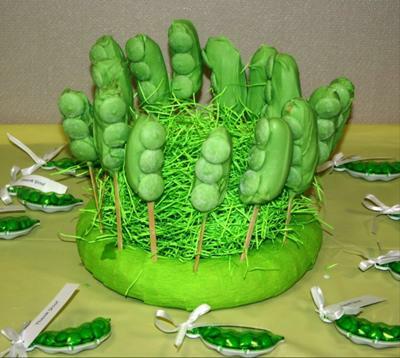 Are you looking for some cute Sweet Pea baby shower ideas? 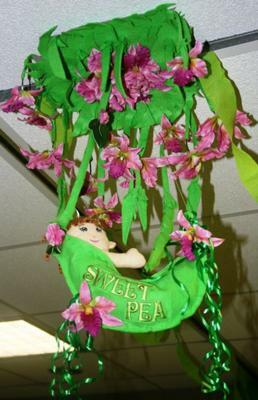 Here are some delightful and original Sweet Pea ideas from one of our awesome readers! 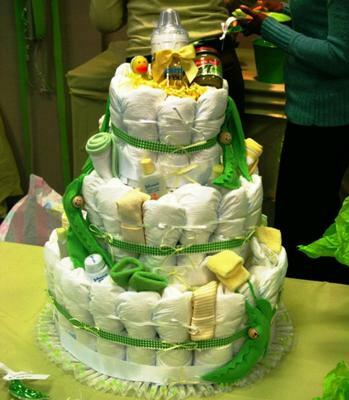 Crystal has submitted numerous diaper cakes, crafts and creative ideas for the rest of us to enjoy! Crystal, thanks for sharing your fabulous ideas! Thousands of our readers are already enjoying them! If you have some creative baby shower ideas to share, we'd love to add them to the website. Submit your baby shower ideas to us right here! This is the first diaper cake I've ever made. I choose the theme, but after looking on the internet for hours, I decided to come up with my own original idea. I took what I knew about the expectant Mom and came up with this. I hand made sweet peas from felt stuffed with cotton balls and glued wooden beads I drew faces on them. It was fun and a huge hit. The show stopper. Haha. I learned hand made decorations make a good gift so much better. I also had an idea for a theme desert. I dipped bananas in green colored white chocolate and added some unmelted while still warm to look like Peas. 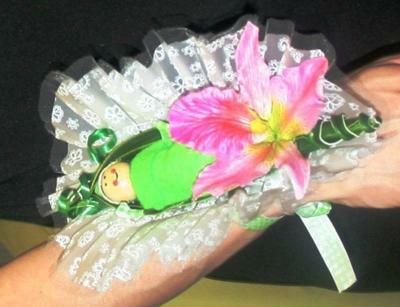 I also made a corsage from the leftover diaper cake decorations. So much from this cake!